Serene, almost impudent, it stands there. You feel a sense of illusion about its reality which leaves you presently to be followed by a feeling that building itself is the only reality and its surroundings are the phantoms.... The effect upon entering the rotunda, no matter how disagreeable the weather outdoors, is that of a delightful, radiant warmth. This is like entering a spacious living room with a hospitable fire on the hearth. Thank you to all who made this a success! 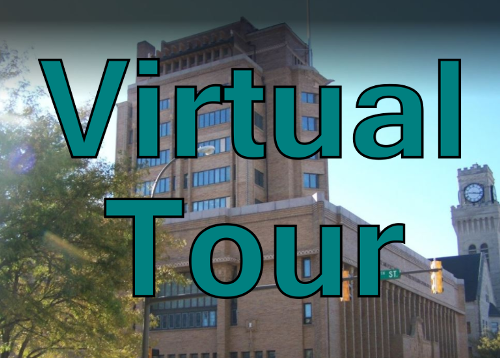 Tours of our courthouse range from a simple visit with your camera, to school group visits of public areas, to pre-scheduled guided tours organized at your request by a county supervisor or official. Certain public areas are also available for public events in the public interest. For more information contact the Board Office at (712) 279-6525 #2. Our courthouse has been on the National Register of Historic Places since 1973 (Click here to see the 80-page nomination form) and has been a National Historic Landmark since 1996. It was named one of the country’s 200 key buildings by New York City’s Whitney Library of Design in 1993. If you work here long enough, you may run into a tourist from overseas, there to simply take pictures and admire the architecture. 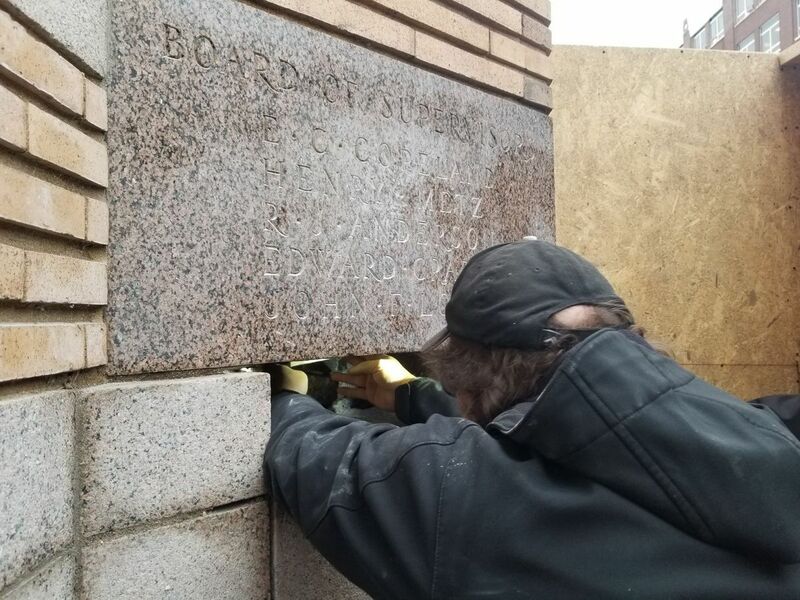 The Roman brick used in our courthouse was from Sioux City Brick & Tile , manufactured in Sergeant Bluff, is made of Loess Hills soil, and was installed by local union workers. 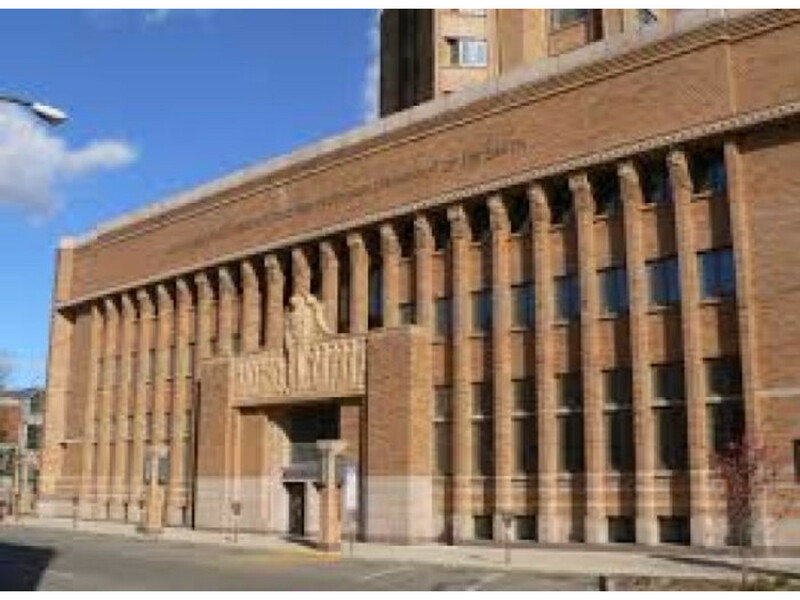 William L. Steele is the architect of our courthouse, the largest public building built in the Prairie School style. The name comes from the long, horizontal framing and arrowhead motifs meant to pay homage to the long, flat horizons of the Midwestern prairies. Bringing in George Elmslie and William Purcell as associates, Steele designed a modern marvel of his time. 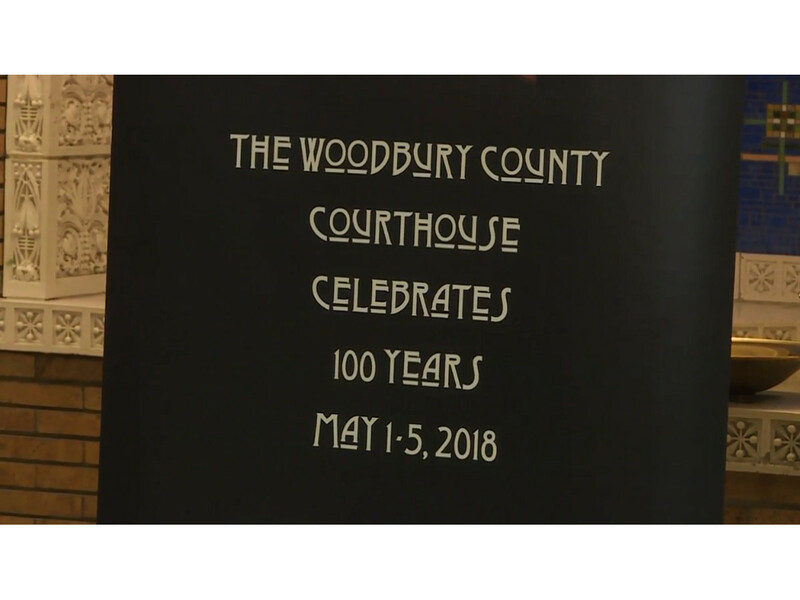 Woodbury County is named after Levi Woodbury—a governor, U.S. senator, Secretary of the Navy, Secretary of the Treasury, and associate justice of the United States Supreme Court—one of few people to serve in all three branches of U.S. government. 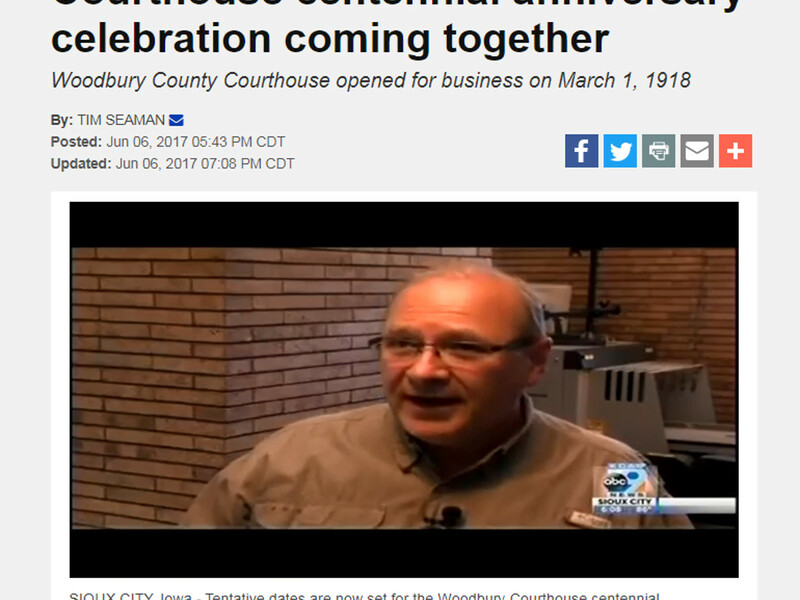 It was almost the Wahkaw County Courthouse, but the legislature renamed the county after finding out what a great name Mr. Woodbury had. Alfonso Iannelli, born in Italy, created the great eagle stretching westward from the eighth floor, and the sculpted figures above the west and north entrances. The west face depicts "The Spirit of the Law"--a Mosiac figure--surrounded by figures representative of society. The north face depicts the father, mother, and child—the family unit upon which civil society is built. Iannelli created terra cotta friezes representing the 10 Commandments that were almost placed inside the west entrance. But controversy on how adultery was depicted nixed it, causing running bands of decorative ornament to be used instead. Over 4,000 cream-colored terra cotta blocks adorn both the interior and exterior. Although they appear seamless at a distance, each piece was uniquely sculpted from freehand drawings. Think of them as 200-lb terra cotta snowflakes. The rotunda’s east mural commemorates the Allied Powers of WWI. Given the fact that Japan and Italy switched teams during WWII, their flags were temporarily painted over for that time. The Woodbury County Courthouse was one of only two courthouses in the country to have its own pharmacy. But it did not serve the general public, and supplies were kept in the former courthouse vault at night. There are over 90 glass light globes in the rotunda and court rooms. In 2016, the board of supervisors tasked their new building services director with finding a vendor who would replicate the damaged ones. A completely undamaged original was needed by the vendor. Quite literally, only a couple were in that state. We came very close to losing a piece of history. For decades, goldfish have had a tough time swimming in the pool on the rotunda’s south side. Either they stink up the area, or their water leaks out, or vandalism gets them. Fortunately, in early April 2018, life was reintroduced. Up until that date, nostalgic building services employees were known to occasionally pay their respects by placing plastic or printed fish in the empty pool. A jail with prisoner and hospital cells is self-contained within five stories of our courthouse. Most cells are currently filled with dust and storage, because there was a clear need to build the Law Enforcement Center across the street in 1988. A jail elevator in the courthouse still allows court personnel to bypass public areas by transporting prisoners directly to courtrooms. The perforated disk at the top of the dome leads into a massive air duct used for ventilating back when smoking inside buildings was a thing. The counter near the center of the rotunda used to be a cigar store. ‘Twas a different time! The atrium’s murals and terra cotta pieces went over 70 years without a substantial cleaning. Accumulated dirt, tobacco smoke, coffee spilled from the mezzanine, and even grime from old coal-fired furnaces had darkened the murals and turned the white terra pieces an ugly yellow-brown. Around 1990, the Minneapolis-based Upper Midwest Conservation Association was called in for the clean up job… and surprisingly… complimented the fact that the originals had never been sealed with a natural resin varnish. Why? Because modern synthetic resin was applied to last for decades, whereas older varnish available when the murals were installed in 1919 “would have turned amber brown within five years,” according to their senior paintings conservator. Lindblade, Lou Ann., et al. 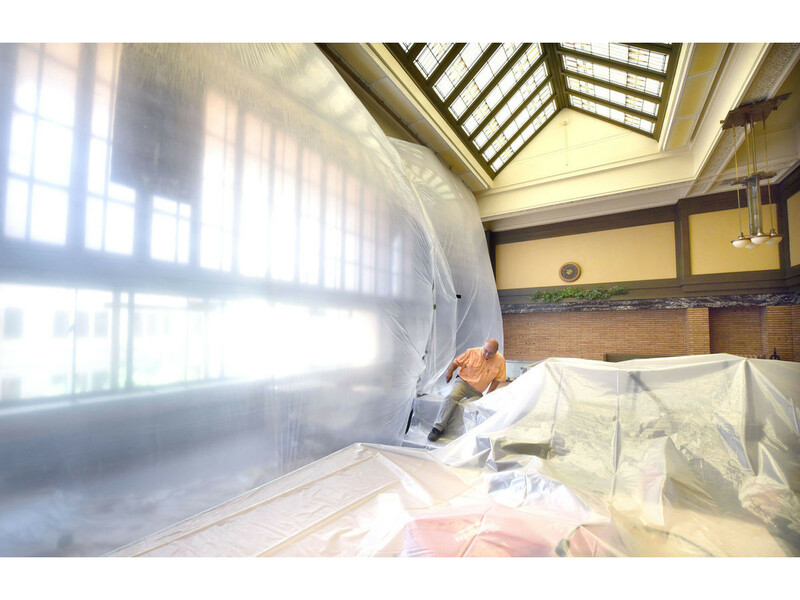 The Woodbury County Courthouse, Revealed. G.R. Lindblade & Co., 2009. 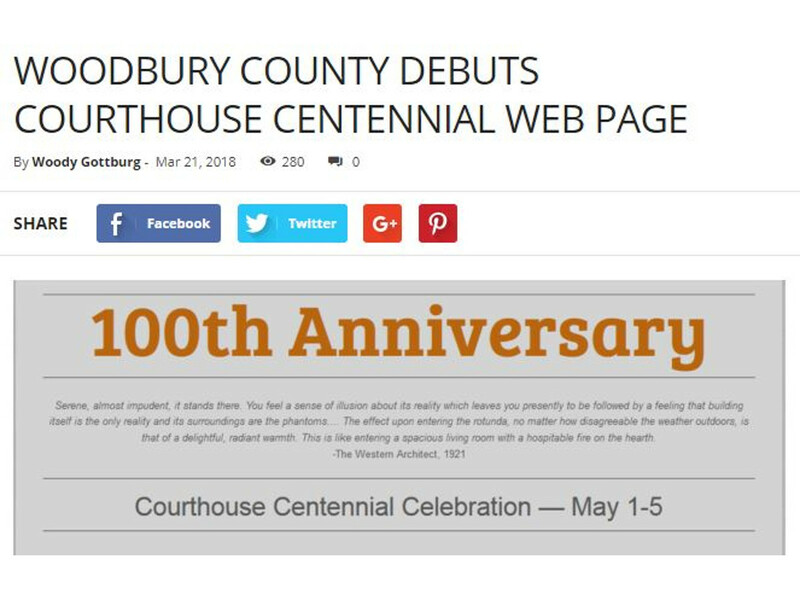 “Woodbury County Courthouses.” Sioux City History, www.siouxcityhistory.org/historic-sites/131-woodbury-county-courthouses. 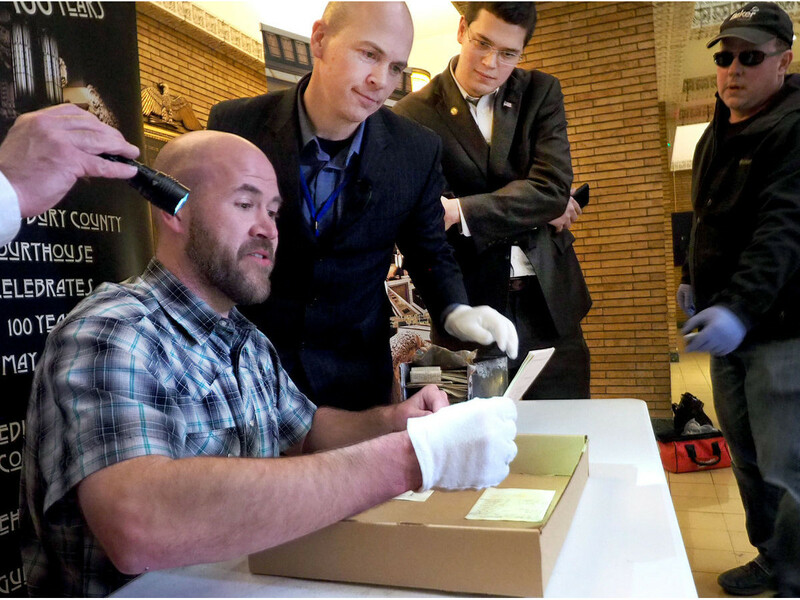 Where can I see the contents of the 100-year old “time capsule” pulled from the cornerstone? The contents were pristinely preserved and will be displayed in the rotunda during the celebration week. 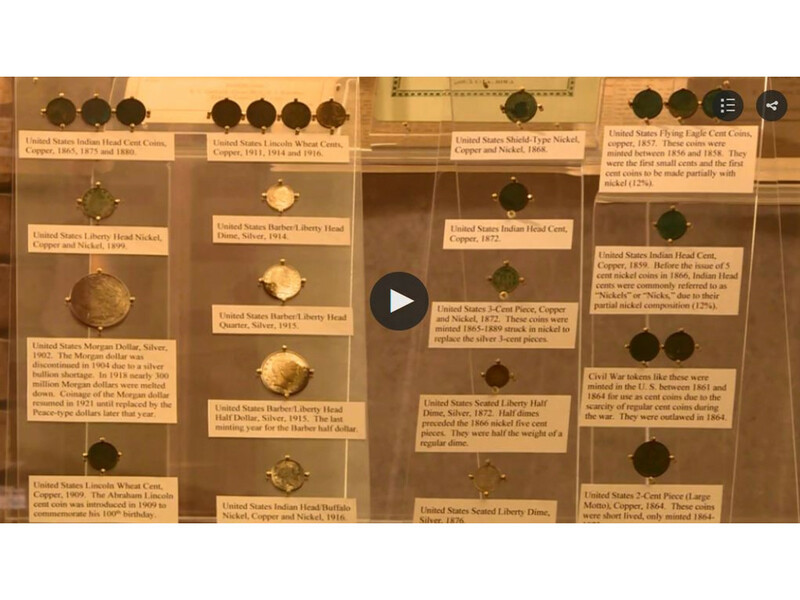 They will then be permanently displayed in either the rotunda or the Sioux City Museum. 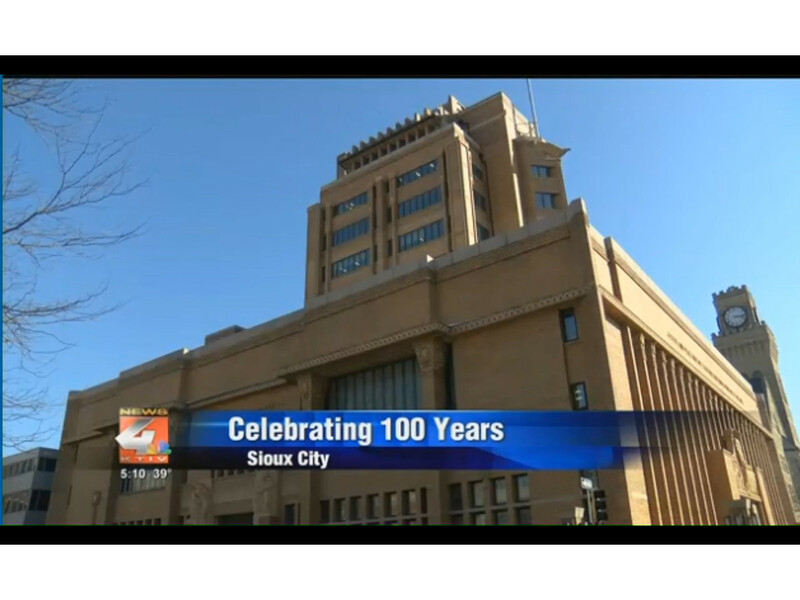 The building was ready for occupancy in March 1918, so why are the celebrations in May? Because this is Iowa, where random blizzards pride themselves in ruining get-togethers in March. The first-floor boardroom is much nicer than the basement. Why did the board of supervisors move their weekly meetings downstairs? I mean, the morgue used to be down there. The first-floor boardroom seats no more than 20 people and is not handicap-accessible. Before the switch, some attendees simply couldn’t find a place to sit. Weekly board meetings draw anywhere from 0-70 concerned citizens. Was the public of 100 years ago as excited as we are about the bold yet intricate craftsmanship of our courthouse? Not so much. The Bar Association thought the courtrooms were too big. 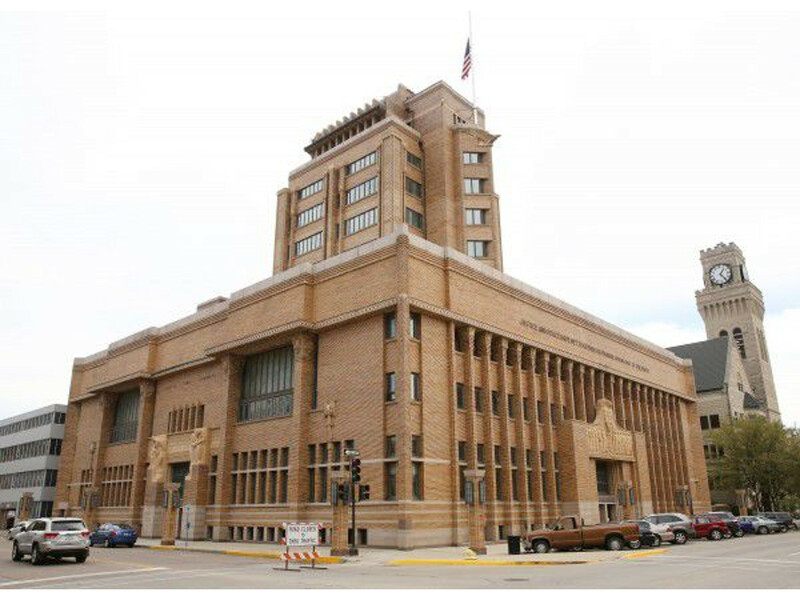 And a businessman’s advisory committee at the time said, “We are firmly convinced that the citizens of Woodbury County prefer a courthouse of ordinary and usual design.” Most saw it as a radical architectural experiment at best, and a foolish waste of money at worst. Waste of money? How much did it cost? Our courthouse was completed in under two years at a cost of about $850,000 (~ $20 million today). Recent expert assessments place the current value between $60-100 million. 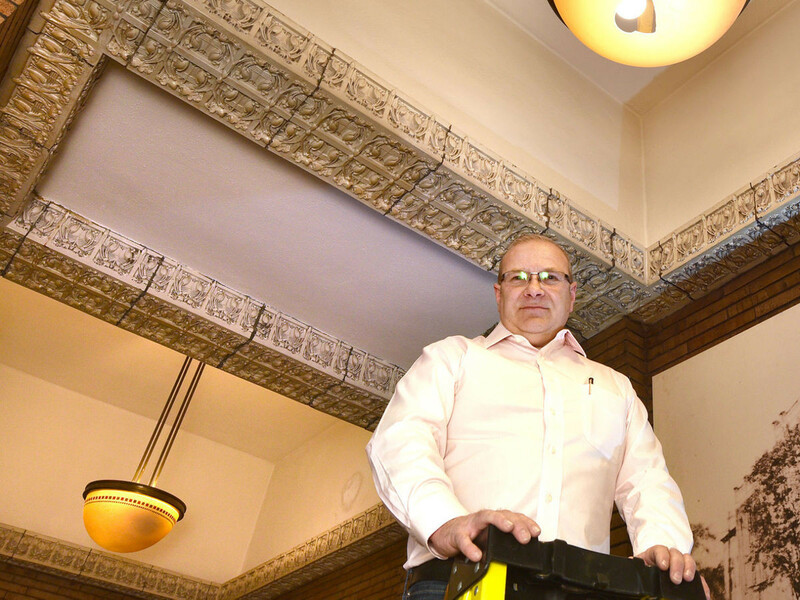 What sort of restoration efforts are needed to enjoy our courthouse for another 100 years? Since the courthouse’s 75th Anniversary, millions of dollars have been spent on its preservation. These dollars have come from federal, state, and local grants, Local Option Sales Tax, non-tax Hard Rock gaming revenues, private donations, and as a last resort, property taxes and bonds. A recent needs assessment was conducted to determine a schedule for long term structural repairs. However, the same experts noted none of those repairs are immediately necessary, and further noted that the wear and tear over 100 years was much less than expected due to its superior construction. That’s bad news. Do you have any good news? Yes! In recent years, Woodbury County has worked closely with Baker Group to complete long-term infrastructure planning and energy improvements to save millions of dollars over the next few decades. In fact, we became the first all LED-lit county in Iowa, and even received a national award for it . This webpage is so hip with it and wow that I can hardly shake a stick at it! Who is responsible for this digital wonderland?!? County Supervisor Matthew Ung and WCICC-IT, at your service.